Social media is an amazing way to connect and even to drive business to your company, and it’s undoubtedly an amazing tool. But in this age of social media obsession I find that people rely so much on their Instagram or Facebook page that when it isn’t enough to make their business a success they are at a complete loss on what else to do to market their brand. I have people ask me all the time what else they can do to promote their business besides post on social media. And the truth is, there are so many things you can and should be doing to reach a wider audience—after all, social media is relatively recent, so people were employing other forms of marketing before it even existed. You may know already how much I love using PR to promote and build your business. But even if you’re not ready to go full force with PR there are lots of things you can try. Many of these tactics are just as easy as social media, and things that business owners absolutely can do on their own time. Here are a couple of ideas. Pitching yourself to a podcast is a great way to get some exposure in a fun and fairly simple way. There are tons of podcasts that are on the smaller side or just getting started that are always looking for guests to bring on. The idea is that you will share some of your valuable knowledge with the podcast audience, and in the process listeners will have a chance to feel like they’re getting to know you. Some of them will then choose to get involved with your brand because they feel a connection to you. Search for podcasts (either on google or right on your podcast player) that are somehow complimentary to your niche and who’s target audience you fall into. Once you have a list of these, visit their website and see if it has instructions on how to submit a guest. They often have a form you can just fill out to pitch yourself! Just remember: focus on what their audience will get out of the information you can share with them. For a step by step on pitching yourself, sign up for my free five-day challenge that walks you through creating a pitch. Similar to a podcast, a guest post will allow you to distribute your information (and your personality!) in your exact words directly to a larger audience. Again, start by finding websites that cover your niche or are complementary to your niche, and look like they cover a topic you can talk on but don’t have articles exactly like what you would write about. Check under the ‘contact us’ tab or ‘about us’ tab to see if you can find information about accepting guest posts and how to submit one if so. Write a fantastic article that best shows off your expertise in a relatable and clear way, and submit it according to the instructions. If they don’t have any information on how to submit but you can tell that they do publish guest posts try to find an email address for the editor and submit directly to them with a short note at the beginning explaining that you would like to submit your piece for publication. Depending on your business, an in-person event can be a great way to get in front of people. The best thing about an in-person event is that face to face interaction is the absolute best way to build a connection with others. Yes, this can be the hardest tactic on this list, because you have to make sure the timing and location of the event works with your schedule, and you have to physically be there, but it also has a huge potential for immediate return. Be as friendly as possible and come prepared with a really specific straightforward explanation of what you do and what you would like the people you meet to do, ie. Do you want them to sign up for your email list? Don’t just have a clipboard with a piece of paper on it sitting on the table behind you- actually hand it to every single person as you’re talking to them and ask them if they wouldn’t mind writing filling it out. (Of course don’t push it if they’re not into it, but you’re going to get tons more responses if you actually ask for it and work it into the natural conversation than if you just sit the clipboard there and hope people will go check it out.) If you’re a brick and mortar business with a physical location be sure to tell every single person where it is and personally invite them to come stop by during your working hours. They’ll feel welcome and they’ll remember you a lot more than anyone else they met if you provide those kind of specifics that they can picture in their head later on once they’ve gone home. A good way to tap into another brand’s existing audience is to do some kind of cross-promotion with another company. Ask if you can put some products or even printed marketing material in their location, shout you out in their email newsletter, or get in on an event they’re hosting. Offer to promote them to your audience as well so that they’re getting something out of it too, but be honest if your audience is currently still pretty small. A true cross-promotion has to benefit both brands and result in your audience learning about them as much as their audience learning about you. You’d be surprised how many people will be willing to refer you to their networks if you just ask. You can do this in a more formal way, by creating a true referral program where current customers get an incentive for referring you to a new customer, but you can also do it more casually. Mention to current customers or people in your network that you are currently looking for new opportunities and ask if they would please pass along your information to one or two people they know. Depending on your business it can also be appropriate (and super effective) to do this in reverse—ask people you know if they have someone they think may be able to use your services and see if they’d be comfortable with you reaching out to them personally. All of the above are going to get you in front of more of the people you want to get in front of, and often will result in a stronger feeling of connection even faster than you can get on social media. Yes, it can feel scary at first to put yourself out there in such a personal way. Let’s be honest, all of these things require you to put more of yourself out there than an Instagram post does– but that’s exactly why they are so effective. So if you’re looking for something beyond social media to get your business out there and reach more potential clients and customers, give one of these a try. If you’re interested in getting more in depth about getting featured in the media for promotion, check out my free 5-day marketing challenge that comes in the form of daily emails, at the end of which you’ll have a completed pitch to send out to media! Or, join the interest list for my new DIY PR course launching soon! So you know you have an amazing brand and you offer something that people will just love and want so badly… if only they knew it existed. The hard part is getting your brand in front of the right people. With so many products and businesses out there, and so much noise to constantly sift through, people don’t just happen upon your brand the way you wish they would these days. You use social media, you have an email list, but you just aren’t getting in front of new people who aren’t already a part of your brand community. You need to reach entirely new people who will be open to and excited by your brand– if they just find out about it. That’s where PR comes in. So what is PR and how exactly can you use it? In a simplified sense, it’s using media to spread the word. It’s securing ‘earned media’ by pitching writers to write articles about you that will be published under their name in a publication. You are featured in the press, and it is considered ‘earned’ because you did not buy it, like you would with a paid advertisement. You earned it by doing something noteworthy and drawing attention to it. Earned media ends up giving your brand a lot more clout because readers know that your business or product is in there because the publication thought it was worth putting in their pages, and that their readers would find it useful. The best part about PR is that it gets you in front of a much wider audience than you would ever get in front of otherwise, for free. You do not pay to be featured in articles, and you do not need to have any other connection or relationship to the audience beforehand, besides the relationship you form with the writer to secure the pitch. Once the article is published though, you immediately get in front of thousands of people who could be potential customers or clients. Maybe not every person who reads the publication will be your ideal customer, and they may not be the type who would ever sign up for your email list, but think about how many of them will know someone who is. The great part is that even these non-ideal customers can share it and discuss it with people who are your ideal customer, or even purchase your product for them when they need a gift! There’s no doubt about it: a media feature gets you talked about, and the additional word of mouth that results from an article helps to amplify the attention you get. Media coverage should be part of a larger strategy though. An article gets tons of eyes on your brand and gets people interested in what you have to offer. The idea is to drive them to more information about your brand so they can continue to learn more about you and develop a personal connection. If the article directs them to your website, or somewhere else that they can find out more information about your business, make sure the messaging they’ll see there is consistent with the messaging in the article, and that it is updated and current. Consider offering something to draw them in even more, like a discount to join your email list, or an invitation to follow you on social media. This is ideal because then you have an easy way to stay in front of them and to keep getting your branding in front of them throughout the coming weeks. It takes time to build brand loyalty, and people often don’t buy into your brand the first time they see it. An article in the media definitely makes a strong impression, but even still you’ll want to take it a step further and make sure they’ll recognize you again later so that they’ll become a loyal fan and you can turn them into customers. 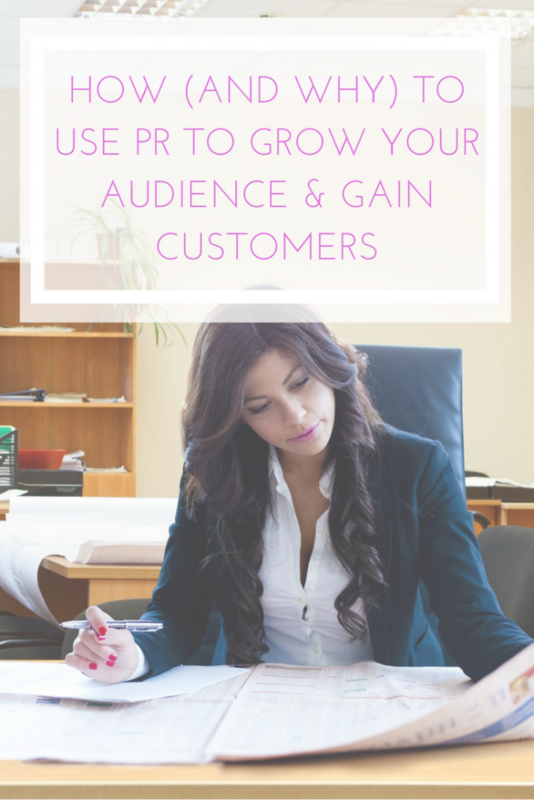 If you would like to discuss how a PR strategy could fit into your marketing mix, I’d be happy to chat, or download my free ebook that outlines easy ways to promote your business through PR and see what you can do on your own!